Lethbridge is a rural township on the Midland Highway and railway line between Geelong and Ballarat, and is 75 km south-west of Melbourne. It was originally named Muddy Water Holes, probably in connection with a chain of ponds along Bruces Creek. In 1854 a township was proclaimed and named Lethbridge. The supposition that it was named after a surveyor, Lethbridge, who was involved with the railway construction is unlikely, because the line was built eight years after the town's proclamation. The Free Presbyterian church opened a school in 1856, and Catholic and Presbyterian schools followed in a few years. All were superseded by a government school in 1874. Local bluestone was quarried from 1860, and became a major industry for the supply of ballast for the railway line in 1862. The quarry also supplied building stone, which has been used for public buildings and memorials. Large blocks were quarried, free of faults. 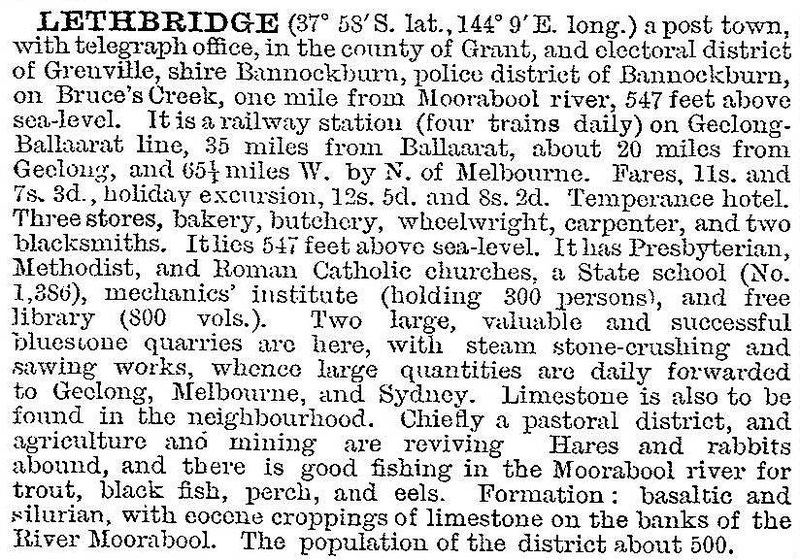 Examples of Lethbridge bluestone are found in the Lethbridge school, Bannockburn shire hall, Victorian Parliament House steps and the Inverleigh war memorial. Football and cricket clubs and a mechanics' institute were established during the 1890s. Lethbridge's settled agricultural population was enlarged by soldier settlement farms after World War II when part of the Moranghurk estate was subdivided. The farms are shared with neighbouring Meredith, but the original slab construction homestead (late 1840s) is near Lethbridge. It is on the Australian and Victorian historic building registers, along with the railway station. Lethbridge has two churches, a school with 115 pupils (2014), a swimming pool set in a park, an oval in a separate reserve, a public hall (1971), tennis courts, a general store and a hotel. The Tarcoola Winery (1971) is north-west of the town, and a bluestone quarry is worked adjacent to the railway line. The town's population has grown since the 1970s, with rural/residential subdivisions.